Whatever goes in an oven, the Maverick Electronic Probe Thermometer and Timer can watch over while you take of other cooking tasks. 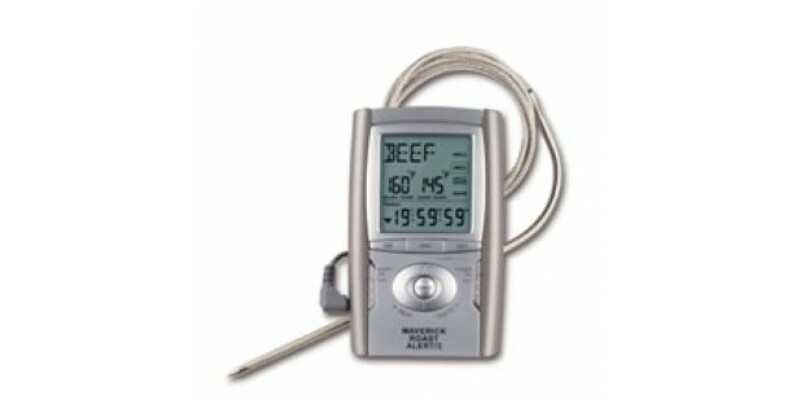 From roasts to ground beef or turkey, it announces with precision the levels of doneness based on programmable temperature and time settings. With up to 15 separate meat selections and room to accommodate specialty recipes, the stainless steel probe with a flexible connecting wire attaches to the remote countertop display unit, which provides easy-to-read details at a glance. Three alert beeps are also programmed in to announce when any food is nearly done, when it is ready to come out of the oven or if it is overdone. A count-up and countdown timer that continues for resting times is another beneficial feature that every busy cook will appreciate. Leaving the Maverick Electronic Probe Thermometer and Timer inserted during the entire cooking process means less juice escapes with repeated temperature testing. Use the presets or utilize the override features for all of your favorite meals.